Since 1980 only three guards have been selected #1 overall in the NBA draft – Allen Iverson in 1996, Derrick Rose in 2008 and John Wall this past May. To say that this latest first-pick point guard will be heavily scrutinized and constantly analyzed is almost an understatement. With the Wizards entrusting the future of their franchise to this one-and-done, record-breaking Kentucky Wildcat, 20-year-old Wall already carries a lot of weight on his rookie shoulders. Named Most Outstanding Player at the Las Vegas Summer League, Wall led all players in scoring (23.5) and assists (7.8), giving Wizards fans good reason to be optimistic. Tonight Wall and the Wizards travel to central Florida to play the Orlando Magic in what will be both teams’ opening game of the 2010-11 NBA campaign. Washington had the fourth worst record in the league last season and was only 11-30 on the road. 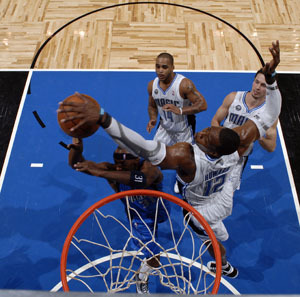 On the other hand, the Magic possessed a formidable home-court advantage by going 34-7 at the Amway Center. People aren’t talking about Orlando as much since LeBron announced his move to Miami and took the media spotlight with him. But let’s not forget that last year Orlando won 59 games, and they are anchored by two-time Defensive Player of the Year Dwight Howard, also a #1 overall pick (2004 draft) and First-Team All-League player. 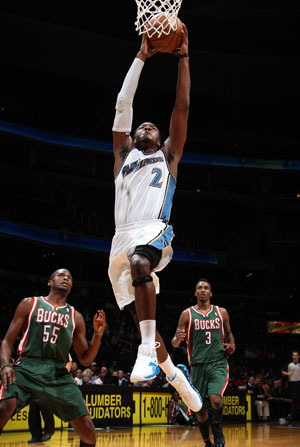 Howard averages double-figure points and rebounds, and he’s one of the premiere shot blockers in the NBA. Led by their super-center and bolstered by a deep roster, the Magic will go head to head with the Heat and Celtics for a shot at the title. Orlando hopes to start this season on a better note than they ended last season when they lost to Boston 4-2 in the Eastern Conference Finals. Because Orlando felt they didn’t match up well against Boston’s bigger front line (which got even bigger with the additions of Shaquille and Jermaine) in the playoffs, they have been experimenting with Rashard Lewis starting at the small forward position during the preseason and will likely continue to explore whether this can be a successful strategy come playoff time. The Wizards will be without three-time All-Star guard Gilbert Arenas, who has a strained tendon in his right ankle. Arenas missed most the 2010 season due to a 50-game league suspension for a felony-gun conviction. He’s also generated some curious and negative publicity for the Wiz and himself this pre-season by faking a left knee injury in a bizarre attempt to give some playing time to teammate Nick Young. Newly acquired guard Kirk Heinrich, a former Chicago Bull, will fill in for Arenas in the Wizards starting lineup. Even if Arenas were playing tonight, this contest is all about John Wall’s debut as an NBA pro. Will Orlando’s newly anointed Wizard cast a proverbial spell on his opponents? Marv, Steve and I will be back in the booth when the Washington Wizards vs. Orlando Magic airs live at 8:00 PM EST on TNT. I’m in the city of Walt Disney style magic getting ready for Orlando’s season opener against Washington. Prior to being known as Orlando, the city of a hundred lakes was named Jernigan after the first permanent settler Aaron Jernigan, a cattleman who acquired land along Lake Holden by the terms of the Armed Occupation Act of 1842. Marv and I are very excited to have Steve back in the booth with us this season, so during our opening night broadcast we gave him a little something to keep him company on the road. Oklahoma City emerged as a surprise contender last season. Led by the league’s leading scorer Kevin Durant, the fledgling franchise more than doubled their win total from the prior year and gave the champion Lakers a run for their money in the first round of the Western Conference Playoffs. Now that they’ve got our attention, how will this exciting, young squad fare next time around? Durant and the Thunder make their season debut against the Chicago Bulls tonight at 8:00 PM EST on ESPN.